SUMMARY: Pocket-sized booklet explaining the industry’s best rehabilitation programme for dogs that are aggressive to other dogs when on-leash. AUDIENCE: If you’re an owner or trainer interested in on-leash reactivity, it’s definitely worth a read, and it will yield non-negligible results if you follow it to the letter. But please do not expect it to resolve the problem fully without further work and specialist help. I see this book as a valuable explanatory tool, rather than a self-sufficient treatment protocol. REVIEW: Both authors have impressive credentials: they are both clinical behaviourist diplomates AND zoology doctorates. They bring together common-sense and academia, an extremely rare commodity in the world of dog publishing. 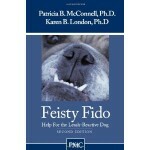 Feisty Fido talks of a problem with epidemic proportions: reactivity to other dogs when on the leash. Associate the stimulus with a pleasant outcome, effectively ‘re-wiring’ the unpleasant feeling previously triggered the presence of another dog. An important side note: The authors appear to be the first to recommend the “where’s the dog” technique: rewarding your dog for looking at the other dog, somewhat of a paradigm shift in the community where, hitherto, we would train the dog to look at the owner. This subtle change of approach makes their techniques that much powerful. Given the authors’ credentials, it is little wonder that the book promotes non-invasive and evidence-based methods. Thus fear not: no paranoid, dogmatic, dominance-based advice from our two good ladies. As ever with dog-dog reactivity, the demands of the programme are somewhat unrealistic, and the prognosis is often guarded. Still, reading the book will help you open the bonnet of a desensitization programme, and will deliver sizable improvements. As often with these highly specialized booklets, I would sooner place it in the hands of a budding specialist trainer than those of a dog owner. My concern is that leash reactivity is best handled by a specialist, as a botched job might achieve the opposite effect. Browse the Book Review archive. Genres: owner manual, professional manual. Book Authors: London Karen B, McConnell Patricia B. Reading Level: Owners, Professional. Star: 4. Bookmark the permalink. Post a comment or leave a trackback: Trackback URL.